This is the first in a series of posts about Le Grande Experiment (which translates into no language except the one we’ve made up), a recent adventure wherein we sent teams to Denver and Italy on a vital mission: to hunt down and test the best equipment for scaling up our process. Our current setup works well for our factory space on Valencia Street, but as we grow into our new factory space on Alabama Street, we believe there are better options out there for improving the quality of our chocolate and expanding our capacity to experiment. While we could do the work on the phone, we find the best results come from hitting the road and getting our hands dirty. In our factory on Valencia Street, we use melangers—big spinning drums with granite wheels—to both refine and conche our chocolate. Melangers use friction to reduce the nibs and sugar down to a particle size that can’t be detected by the tongue, while creating heat that also conches the chocolate—distributing the particles evenly throughout and allowing for volatile aromas to evaporate off over a few days. The longer a chocolate is in a melanger, the mellower it tends to be. The melangers we use now do two jobs at once: refining and conching. Because we currently use one machine to do two jobs, it means that landing on the flavor profile we’re looking for doesn’t always coincide with the moment the nibs reach the right particle size. If we could separate these jobs into two machines instead of one, we could optimize for both flavor and texture, and possibly decrease the viscosity of our chocolate which would make it easier to temper. The machines we had in mind were all the way in Denver and Italy, so we packed our bags, prepped and roasted some beans, and set off to try our luck. We called it Le Grande Experiment. The first part of Le Grand Experiment found us on a plane to visit Packint Chocolate Equipment in Borgo Priolo, Italy, an hour south of Milan. Packint is owned and operated by a lovely Italian family who already knows a thing or two about bean-to-bar production because they are doing just that on the same machines they are manufacturing and selling. This is important not only because they use the machines on a regular basis and know how to fix them when things go wrong, but it also means that they care deeply about maintaining the unique flavors of the bean throughout the process. Greg and Snooky with the folks from Packint. 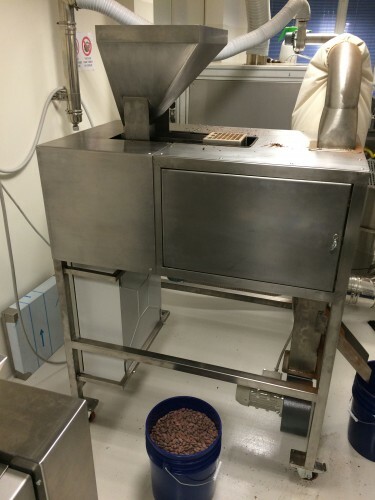 In the two weeks before the trip, we sorted and roasted 240 kilograms of Madagascar beans. To squeeze this in under two weeks was no small task, but luckily for us, Dandelion is full of awesome and dedicated staff. It didn’t take much convincing to get a handful of employees to participate in late-night and weekend prep parties in the bean room, and in no time at all we had everything prepped, roasted, and packed to be sent to Italy and Denver with corresponding amounts of sugar. After our beans successfully cleared customs, we got to work in Italy opening up all 25 buckets of beans and sugar, and spent the first day cracking and winnowing. The machine at Packint that we used is likely too small for our growing production needs, but we loved how quiet this machine was and how consistently sized the nibs were. On the second day, we passed the nibs through Packint’s two roll pre-refiner three times, each time decreasing the amount of space between the rollers and refining the nibs into fluffy choco-flakes. This was by far the most interesting and mesmerizing part of the process to watch, and we were especially intrigued by the lack of heat generated by this refining action, since heat is one of the more difficult variables to control using our current machinery. Packint’s all-in-one cracker and winnower. Packint’s roll refiner, crushing nibs. Right now, in our factory at Valencia, we use a Hobart cutter-mixer to pre-refine nibs before loading them into the melanger. The mega blender-type action of the blades inside the cutter-mixer sometimes heats the nibs to temperatures upwards of 175°F, which is very high considering some of our roasts are done at 180°F. It’s hard to know the effect of this added burst of heat, but we like the idea of reducing the number of unknown variables in the process as we plan to make more chocolate. On the third day, we loaded the ball mill with the fluffy choco-flakes. If you’re like me and have never seen or really heard of a ball mill before, imagine a big (150kg), upright tank filled with a bunch of marble-sized steel balls and an agitator arm in the middle. The arm rotates, forcing the steel balls to spin around the tank and grind the cocoa mass into smaller and smaller particle sizes. We added the sugar about an hour into the process and waited a couple of hours for the particle size to reduce to about 25 microns. Tasting chocolate that was refined but not conched—smooth in texture but terrible in flavor— was an unfamiliar (and somewhat unpleasant) experience! On the fourth day, the refined chocolate was pumped into a 200kg rotary conche—an enclosed machine that stirs the chocolate while forcing controlled air through the chamber to carry the volatile aromatics away—and stayed there for 48 hours. 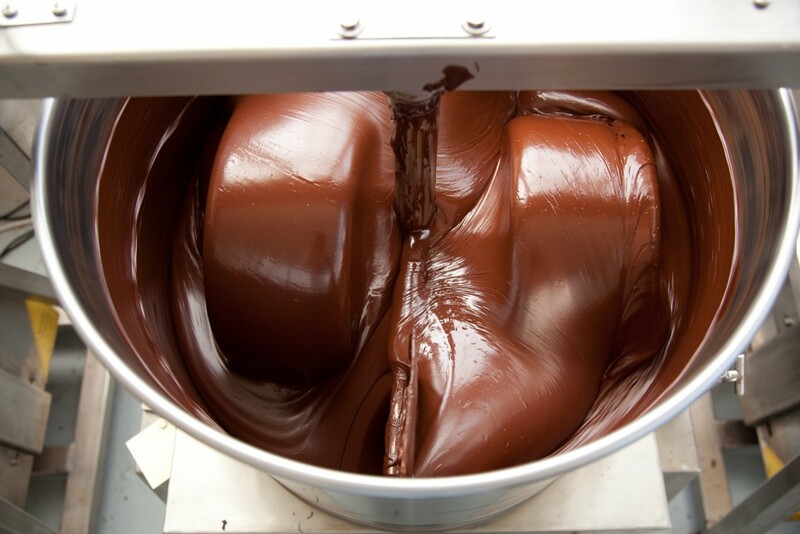 Conching is a process that aerates and agitates the chocolate, allowing moisture to release and volatiles to burn off. Additionally, after the rotary conche, the particles are rounded out and covered more evenly in cocoa butter, which gives the chocolate a smoother texture and a better mouthfeel. After the chocolate was finished in the conch, the wonderful staff at Packint put it all right back into the buckets the beans originally arrived in so that we could bring them back home and run even more experiments. We also took samples at various stages of the process to bring home and compare with our own chocolate as well as our results from Denver. Back at the factory, the tests will help us to better understand particle shape and size, and to learn how each set of equipment produces these changes in the chocolate over time. The trip was extremely worthwhile and educational for us. 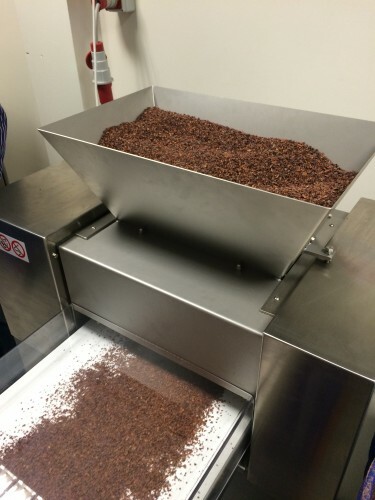 Having the opportunity to test out machines before potentially buying them is indeed a luxury, but it also helps us make more informed decisions about making more chocolate using completely different machines! Stay tuned for the next installment of this series, in which we travel to Denver and play on more machines with chocolate doyen, Steve DeVries. ← Dandelion Pre-Valentine’s Party is Almost Here! What range of temperatures did the chocolate heat up to while in the rotary conche? Hi Dave! The chocolate went through four phases in the rotary conche—during the first two, the temperature reached 50°C, and during the second two phases, it reached 45°C. Recently, I had the pleasure of visiting your factory on Valencia after tasting your chocolate at the Farmers Market. I have never tasted chocolate that good before. I am very impressed with the lengths you all are willing to go through to make the best product you possibly can. I think it is really cool and awesome you are not just buying equipment to make your production faster to sell more product and make more money. It really shows me that, yes, of course you would like to make money but only by making the best product you possibly can!